It’s been a good year here, with many things accomplished You have spurred me on, especially on those days, I wasn’t really wanting to do anything. THANK YOU! I hope that in some way this blog has been a blessing to you. I’m always open to what you would like to see or about which you’d like to learn. It has been a year filled with quilts and some knitting. I’d like to expand in other directions this year as well as continue. And I would love it if you would like to join in. As well, your comments are blog life blood. Meanwhile, I’ve started a knitting project this afternoon. It is very simple. It uses #2 needles with 64 stitches. After the k2,p2 ribbing is done, I’m just continuing but every third row is a K2 tog, yarn over, p2. Simple, but I wanted these to be just a bit different from the plain ones. I get bored doing the plain ones, but sometimes, don’t know what to do with self striping yarn. For those of you still looking for a good devotional. We listened to the Daily Audio Bible (DAB) on our phones or computer each day. It is incredible what you hear when you listen to someone else reading through the Bible. Though I’ve read and studied the Bible, there were still parts that I didn’t hear the first time, or had forgotten. We are repeating the program again this year. Beautiful yarn — love the color way. Your socks are beautiful. Thanks for the pattern directions. Also, thank you for the devotional suggestion. Happy New Year! Thank you! You are welcome. 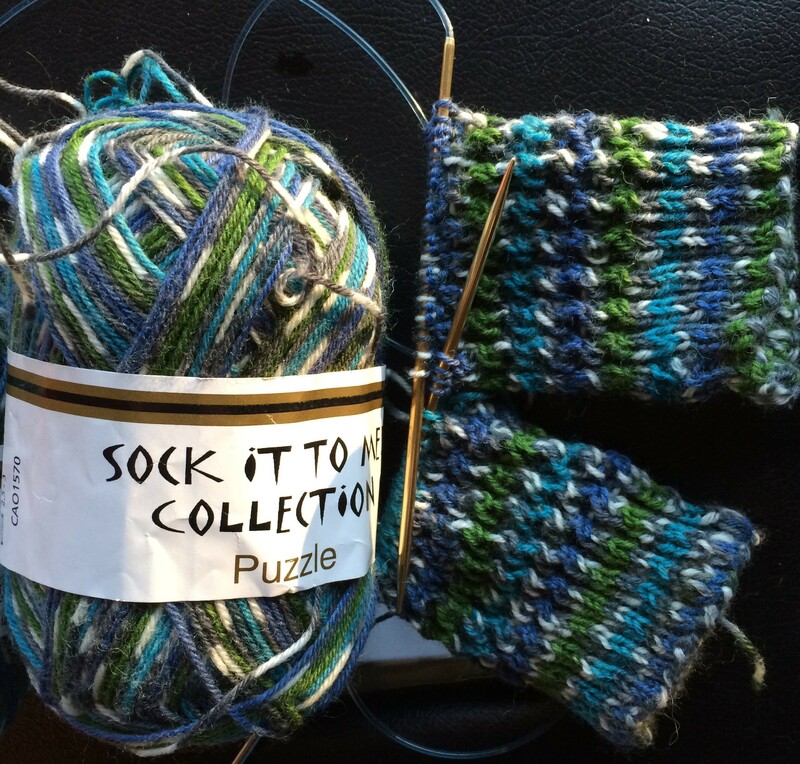 It is simple, but a bit different than the ordinary self striping. Fun socks! Looks like an interesting pattern. I also get tired of plain socks! I like the superwash because I can just put them through the washer and dryer which is great for everyday. But I agree that a change of pattern is good.